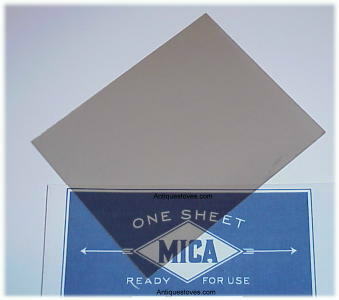 What size sheet mica do you need? The Sheet Mica that Antique Stoves offers is clear grade and spotted grade. Newport made in Albany New York, New Clarion made in Bangor Maine, Glenwood Oak cylinder stove manufactured Weir Stove Co. The Universal Parlor Stove, manufactured in Troy NY, T & P Albany, Laurel cylinder by the Art Stove Company Detroit Michigan, Oakwood, Noyes & Nutter.